Another deer season has slipped past me, ending without my filling a tag, just as it has the past couple of years. That’s okay though, because I’ve certainly filled enough tags in my lifetime, and if I never tie a tag to the ear of another whitetail, I’m fine with that. Not that I did not have my chances. I passed on many does throughout archery, rifle and flintlock seasons, and had a chance during archery season at what would have been the biggest buck I’ve ever taken. In the darkness of early morning on the second to last Saturday of archery here in southeast Pennsylvania, I was up a tree that grows beside an old logging road. As unusual as it was, there was an inch or so of fresh snow on the ground that fell the night before, making the woods seem so much different from the earlier part of the season. As first legal light was widening through the forest, I looked to my right and saw the unmistakable figure of a walking whitetail coming in my direction along the worn road. With a few more steps in the low light of that uncommon morning, I realized it to be a buck and I quickly grabbed my bow, which was hanging on a small hook screwed into the tree. In seconds, I saw a big rack swaying slightly with each step the deer was taking as he moved closer, walking at that familiar pace bucks do while searching for a doe. I realized he would come close to my stand. He paused for a second a mere 5 yards from my tree, looked up at me and jumped back. I, all the while ready to shoot, never released an arrow as he jumped away so quickly. He then stood at 10 yards looking at me up in the tree, but he had his body facing away, not offering a clean shot. Within seconds he took a few more hops, and I thought he would go down over the hillside in front of me. He chose instead to turn sideways and walk into the small clearing that spread in front of me, broadside at 25 yards. I shot and heard the “whack” of the arrow. In the darkness I knew not if the wallop from the arrow was made from hitting him or a tree. On the ground quickly, I saw no blood where he had stood. I followed his huge strides through thick underbrush for a few yards, also without seeing a drop, and returned to where he stood. I found my arrow imbedded in a fallen log where a deflection from a sapling that grew between myself and the buck had turned my shot away. A complete miss, which I was relieved with, because if I don’t make a death shot, a miss is the next best thing. That episode took only a minute or so, as it usually does with most encounters with big bucks. But it will always be a wonderful part of my thoughts of deer and hunting them, joining so many of the other wonderful moments I have stored in my head from all my years of hunting. I would like to believe that just about every deer hunter has special moments he or she can recall. Remembering special moments with whitetails is a valuable part of hunting them in the first place Their beauty, gracefulness and incredible range of senses only adds to any experience of seeing deer when afield. So, the blessing of being a serious deer hunter brings me to this: chronic wasting disease. I recently read a couple of interesting articles on CWD. 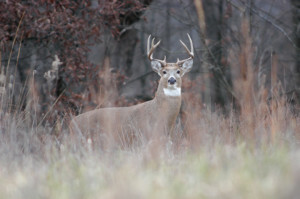 In one piece, the author stated that CWD has now been confirmed in 25 states, and included seven states where the disease has spread since the fall opener. He also referred to maps showing the occurrences of CWD close to where transported captive cervid were moved. As troubling as that is, even more worrisome is another article that dealt with the overall apathy and flat-out denial of CWD by hunters and numerous politicians across the country. Recent press releases by the Pennsylvania Game Commission state unequivocally that CWD is caused by prions as the infecting agent, and not other alternative theories that have not been researched. Make no mistake, CWD kills without exception, it is spreading, there could be no hope of deer resistance to the disease within the next 50 years — if it could even ever happen — and it’s not impossible it could enter the food chain of humans. People in general show little concern for CWD, plus being uncooperative in attempts to halt CWD spread. This was recently highlighted by the commission’s failed attempt to reduce deer numbers in a 100-square-mile area of Blair and Bedford counties because private land owners would not allow for it to be completed. This fight to stem the spread of CWD should not come down to a “push-it-aside-or-blame-game” issue, but rather, “we’re all in this together” and we’d better help – in every way possible – game agencies across the country in this battle. If these efforts fail, hunters had better get ready for a hunting world without deer or elk.